Broken Bones and Fractures | Injury Claim Value | Should You Sue? Have you suffered a broken bone or fracture as the result of an accident? Broken bones and fractures are common injuries where victims can sue for money damages if someone else caused your injury. The injury claim value of broken bones and fractures depends on the nature and severity of the injury. Nearly all accidents that result in broken bones and fractures warrant serious medical attention. When an accident causes damage to the skeletal structure, it is also common for the surrounding tissue, veins, and organs to be damaged. Our injury lawyers can speak with you to help you determine whether to sue and the potential value of your claim. If you were not responsible for your broken bone, why should you be left paying the medical bills? How will a lawyer determine what my claim is worth for a broken bone? Several factors will determine the value of a broken bone or fracture insurance claim. First, the value of your claim depends on the type of broken bone injury. Insurance companies will assign different values for a broken arm, a broken bone in the foot, a broken collar bone, or a broken pelvic bone. In addition to the anatomical location of the injury, the value of your claim will depend on the type of fracture and other symptoms the injury has caused you to experience. If you or a loved one has experienced a broken bone or fracture from an injury accident, contact our Kansas lawyers today for a free consultation. You may be entitled to money for your injury, lost wages, and pain and suffering. Having a team of lawyers and medical experts experienced with broken bone and fracture injuries is important to maximize the value of your claim. We can fight on your behalf to make sure you get the money you deserve for a broken bone injury, while you and your doctor focus on recovery. Broken bone experts are important where there has been serious damage to the body. It might be necessary for a physician to explain to the insurance company, judge or jury, the extent of damages your fracture or broken bone injury has caused. Bone forensic experts are necessary when it helps to reconstruct the accident that caused your bone injury. A bone forensic expert may testify about the various causes and risk-factors present in your case that may have contributed to your fracture. 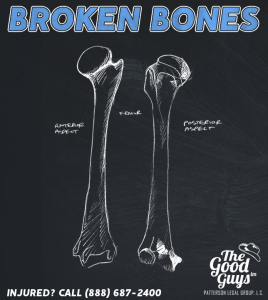 These experts help to explain the basic mechanics of how the broken bone injury occurred. Broken bones can occur on all parts of the body, but are most severe when they involve the neck or back. Sometimes it can be hard to tell whether a child has broken a bone because they do not have the ability to communicate their symptoms. As a parent, there are several reliable signs you may look for in a broken bone injury, including: swelling in the affected area; severe pain; tenderness in one spot; or an inability or unwillingness to move one limb. If your child has a broken bone, it is important to seek medical help immediately. If your child’s head, neck, or back may be injured, or if the fracture is so severe it has punctured the skin, do not move him/her. Call 911 instead. Broken bones in children may cause permanent damage or stunted growth. Usually, with the correct treatment, bones will re-harden and regain their original shape and strength. To ensure your child does not suffer from permanent damage, it is important to receive the medical treatment necessary. Our firm can work on your behalf to make sure you have the ability to seek the proper course of treatment to restore your child’s health. Is it important to act quick? In nearly every broken bone or fracture injury case, time is critical. If you have been injured in an accident, the clock starts ticking at the moment of the accident. An experienced broken bone lawyer may need to collect and preserve evidence which may be important in presenting your case. In some broken bone injury cases, it is necessary for a lawyer to collect evidence relating to your injury and document the accident scene and vehicles involved in the accident. The evidence collected is sometimes used by medical experts to reconstruct the events leading up to your bone injury, or the accident scene itself. Methods used for treatment of broken bones and fractures are also most effective if started right away. The Good Guys will fight on your behalf for your broken bone injury to get you the compensation you deserve, while you and your doctor focus on your health and recovery. Compensation won’t heal a broken bone, but it can help you get your life back on track. Text or call us today for a free consult at (888) 687-2400. We were/are very pleased with the way we were treated and represented. Thank you very much. I was extremely satisfied! The process was quick, fast and easy. The staff always knew what was going on and were able to answer all of my questions. Your legal group kept me informed at all times, answered all questions I was concerned about, and called me back promptly. I would recommend family/friends to your legal group. These guys are absolutely awesome!!! !